What was the most memorable and biggest achievement of Nepal Cricket Team so far? We can argue on this whole day, taking side of some prestigious moment. To qualify for World T20 was first and foremost noticeable achievement for Nepal, which helped them to place themselves in world cricketing map for the very first time. Couple of victories in that competition had fragrance the moment. Another big moment was to claim ODI status for the very first time during ICC World Cup Qualifier 2018 in Zimbabwe. Moving forward, another prestigious moment was to play their first ever ODI match against Netherlands on August 1. Above all these, first ever ODI victory against Netherlands by 1 runs on 3rd August will remain more special. Today we are going to present you a short conversation with a person, who was involved with Nepal Cricket Team in one of above mentioned prestigious moment. He was batting consultant of Nepal Cricket Team for ICC World Cup Qualifier 2018. Yes, he is non-other than Mumbai’s Umesh Patwal. According to him, he has short but sweet memory with the very anticipating Nepal Cricket Team. He showed his love and support for this Himalayan nation through his courageous words. Patwal was batting coach of one of the best rising team of world cricket, Afghanistan, back in 2014. He was academy coach at Vidarbha Cricket Association, Director of Cricket at Global Cricket School and Head Coach of Payyade Cricket Club. He is initiator and director of IthinkSportz. He started it back in January 2017 with unique way of coaching where body balance and stability are focused. 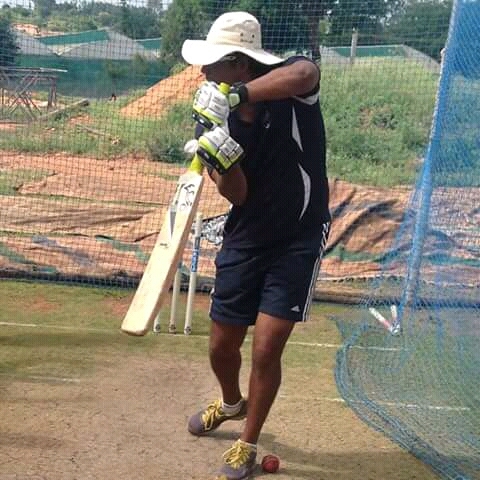 Currently he is coaching the coaches in Mumbai. What variation in stability do you find as a difference between Afghan and Nepali Players? There’s not much difference. Passion for the game in both nations is wonderful. Nepal board is the major reason for their downfall. The team and its leadership under Paras Khadka is amazing. Who are the most skilled batsmen when you have to choose among the Associate nations? Paras Khadka and Dipendra Airee could possibly be the best associate players. Do you think a concept as well as campaigns like IThinkSportZ must be available to the Nepalese youngsters? Shouldn’t it be initiated in the current cricketing scenario? Yes they can send them across or initiate Ithinksportz to come and do a 10 days camp for Players and coaches. What is the main component that is making Nepalese batting so inconsistent over years? By your experience what is the prominent factor affecting Nepalese Top Order collapse in most of the matches? Continuous guidance and quality practice and matches are required. They need a schedule which could offer them annual Programme. How was your short tenure with Nepal Cricket Team? What is the biggest positive factor of Nepal Cricket Team (In Your View)? Brilliant!! We were able to achieve what we planned. ODI status was the goal more practical in the World Cup qualifiers. The team has a very good leader in Paras, Malla and Sharad. Sompal, KC and other players can make some history in coming years. Rohit, Anil and Airee are brilliant youngsters. What kind of role do you think BCCI can play to help Nepali Cricket grow? Helping them with playing facilities and players to have more exposure in Indian domestic circuit. Like, what should be the next step both nation should take together? Nepal Cricket should put their effort and BCCI can add one team from Nepal into their domestic ODI league. In which department, do Nepali cricket lacks the most? In cricket it’s always going to be batting as its one ball game. Not just Nepal but you pick any international teams. So, what Nepal needs to do to tackle it for some instance? They need to keep playing some tough opposition to work out their skills and game. Continuous pay to players is very essential, so they can train freely and continuously. Do you have any personal plan to be associated with Nepali cricket in near future by any mean? Won’t be able to answer now. I have lots of expectation with Nepal Cricket Team. Can we see IThinkSportZ functioning in Nepal in near time? Have already had a coach associated with IthinkSportz. Nishant Jani work with Malla’s academy. Jani was there for few weeks. How do you see Nepal’s chances to qualify for Asia Cup 2018? I wish to see them in Dubai. That’s what I see. What is the main reason behind Nepal success in last 6 month (In Your View)? The team works under one brain of Paras Khadka and all the players and officials want Nepal cricket to be on global map. Do you have any message for Nepalese fans? Yes I do have. The fans support is the biggest inspiration for the players to do well as they don’t want to disappoint them. Their love and support for standing behind their team has given them courage to perform under such poor facilities. A message for the families of all the players which has always stood by them. A Big Salute to their parents and families for standing by them in difficult financial conditions. It’s a sacrifice and patriotism for their nation. At last, do you have any suggestions for Nepal Cricket? The passion for the game could be the focus and lack of Nepal Cricket Board is effecting their growth. They need to fix the problem soon and then tie strong relationship with BCCI. Today is the app generation and things are easier than before. Fantasy cricket is one of them that are online game depending on real cricket players performance in the real matches score. If players are able to earn maximum points then they are winner. Yes I am talking about dream 11 if you want to play fantasy cricket and win daily bucks. The good thing about this Dream 11 app is that you can join free and be a part of win win situation daily. Also go through easy guide to use this app for the fantasy cricket. 1. As a first step you need to register with fresh email id or password or you can register it with facebook ID and Google. There is no charge involved for registration. 2. Now all you need to do is pick any of your favourite team from your favourite game cricket, football and kabaddi. Suppose you select cricket and its upcoming match then create team also. 3. Once you are done with this then you have to select 3 to 5 batsman and there is also option of auto select of batsman, baller, keeper and more. So it is so user friendly and if you want anymore guide then you can go through how to play option where you will get immense solution for you though it is so easy to figure out about this app Dream 11 fantasy cricket. Though fantasy cricket supports many apps but Dream 11 is best so far ever used. You might not be known that by earning more and more points you can win cash. So have you experienced ever fun and wining cash together. Fantasy cricket league is genuinely amazing platform and the real way to earn money as well. For that you need to join any contest with your players. Daily latest updates about the cricket and your favourite games on your new app. You need to study the present conditions and while playing fantasy cricket you need to make strategy and strike when iron is hot. Most importantly by using Dream 11 app you can win daily cash easily and without making too much effort. Fantasy cricket tips and tricks are easier than any other such apps. Dream 11 Sports Guru is the ultimate stop solution for cricket lovers and it can be downloaded easily. Compatible with many platforms as it supports Android, Apple devices, Windows. If you want more info you can join Dream 11 Sports Guru Cricket and win daily. Every single detail will be known to you about the game you are playing. – Dream 11 Prediction Today.